In an era of declining budgets and adversaries’ evolving capabilities, quick, affordable and routine access to space is increasingly critical for both national and economic security. Current satellite launch systems, however, require scheduling years in advance for an extremely limited inventory of available slots. Moreover, launches often cost hundreds of millions of dollars each, due in large part to the massive amounts of dedicated infrastructure and large number of personnel required. DARPA created its Experimental Spaceplane (XS-1) program to help overcome these challenges and create a new paradigm for more routine, responsive and affordable space operations, reducing the time to get capabilities to space. In an important step toward these goals, DARPA has announced Phase 2 of the XS-1 program, which seeks to design and fabricate an experimental unmanned spaceplane using state-of-the-art technologies and streamlined processes, and fly the vehicle ten times in ten days. The reusable XS-1 would demonstrate the potential for low-cost and “aircraft-like” high-ops-tempo space flight, enabling a host of critical national security options while helping to launch a new and potentially fruitful commercial sector. A Special Notice was posted today on FedBizOpps announcing the XS-1 Phase 2 Proposers Day, to be held on Friday, April, 29, 2016, in Arlington, Virginia. 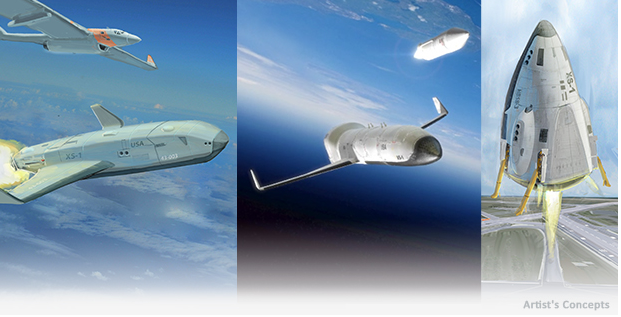 XS-1 envisions that a fully reusable unmanned booster vehicle would fly to high speeds at a suborbital altitude. At that point, one or more expendable upper stages would separate, boost and deploy a satellite into low Earth orbit (LEO). The reusable first stage would then return to earth, land and be prepared for the next flight. Although relatively small by conventional aircraft standards, the XS-1 flight booster size—akin to a business jet—would be sufficient to validate credible scaling to larger reusable launch systems. Moreover, demonstration of on-demand and routine access to space, akin to aircraft, is important for next-generation DoD needs. Fly 10 times in a 10-day period (not including weather, range and emergency delays) to demonstrate aircraft-like access to space and eliminate concerns about the cost-effectiveness and reliability of reusable launch. Launch a 900- to 1,500-pound representative payload to demonstrate an immediate responsive launch capability able to support both DoD and commercial missions. The same XS-1 vehicle could eventually also launch future 3,000+- pound payloads by using a larger expendable upper stage. Reduce the cost of access to space for 3,000+-pound payloads, with a goal of approximately $5 million per flight for the operational system, which would include a reusable booster and expendable upper stage(s). Successful design would require integrating state-of-the-art technologies, processes and system approaches to deliver routine aircraft-like operability, reliability and cost efficiency. In particular, incorporation of autonomous technology and operations promises to significantly decrease the logistical footprint and enable rapid turnaround between flights. Structures made of advanced materials, cryogenic tanks, durable thermal protection, and modular subsystems would make possible a vehicle able to launch, fly to high speeds and then land in a condition amenable to rapid turnaround and launch with the next payload. Reusable, reliable propulsion would also be essential for a low-cost and recurring flight capability. Specifically, the program is structured to directly transition any successful technology to the industrial and commercial launch sectors, with the goal of enabling new launch markets and sale of launch services back to the government at dramatically lower costs and more rapid time frames than are possible today. By ensuring the technologies and launch systems would be available through the commercial sector, government leaders would have the opportunity to begin relying on XS-1 and derived systems. Militarily-relevant applications of the technology may also spur adoption and help enable future capabilities such as disaggregated spacecraft architectures and next-generation, reusable space-access aircraft.